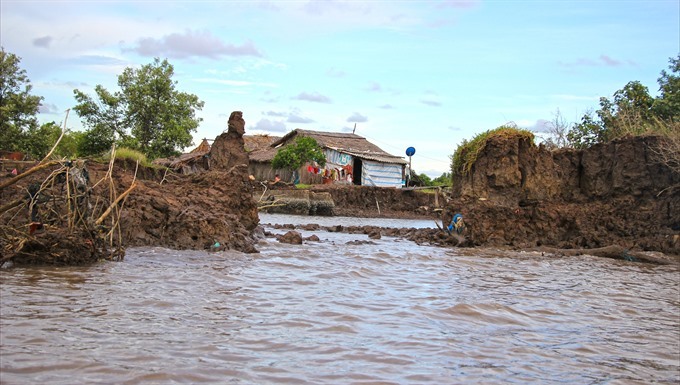 CÀ MAU – Hundred metres of land along rivers and coastlines have been destroyed by unusually strong winds and waves, combined with rising tides in the southernmost province of Cà Mau. According to the provincial Agriculture and Rural Development Department, waves and rising tides have caused severe land erosion at 25 sites in three districts of Năm Căn, Ngọc Hiển and Đầm Dơi. Additionally, the increasing use of high capacity waterway vehicles on rivers has contributed to the problem. Nguyễn Long Hoai, chief of office of the Steering Committee on Natural Disaster Prevention and Search and Rescue said earlier this week that at least 132 households were living in dangerous areas, with the appearance of cracks and at a high risk of erosion. A lack of funds was blamed for the failure of local authorities to build resettlement housing areas for residents, away from danger hotspots in order to ensure the safety of people and property, Hoai said. Unusually strong winds and waves had damaged a number of areas in Năm Căn District, said Nguyễn Văn Nhiên, deputy chairman of the People’s Committee of Tam Giang Đông Commune. The situation had worsened over the week, and strong waves destroyed over a kilometre of coastal land along Hố Gùi Hamlet, according to Nhiên. Dozens of metres of protective forest and shrimp farms also suffered damage due to erosion. There are no firm statistics about the damage yet. Erosion will continue to threaten the lives of local people if no solutions are forthcoming, and the situation is set to get worse. The total coastal length of the key protective forests located in Tam Giang Commune is about 13 kilometres. Between 2007 and 2014, over 260ha of coastal land suffered erosion, according to a report by the local Protective Forest Management Board. At the moment, there is only about 500ha left. The crucial protective forest area would be wiped out if measures were not taken soon, the deputy chairman said. To prevent damage caused by landslides ahead of the rainy season this year, the province warned local residents living near and along rivers and dykes at high risk of erosion to heighten vigilance. "People need to actively prevent land erosion, especially at night," Hoai said. Local residents should inform the nearest local authorities of cracks so that measures can be taken to reinforce the land or move people out of danger, he said. The committee would continue to cooperate with local authorities on reviewing waterway systems and installing traffic signals in order to restrict high-capacity vehicles on rivers and canals, Hoai added.